Mesopotamia - All evidence today points to Mesopotamia being the "Cradle of Civilization". The word is Greek and means "land between rivers". The Tigris and Euphrates flow southeast and empty into the Persian Gulf, creating one of the most fertile regions on earth in ancient times. Indeed, Mesopotamia is part of the region known as the "Fertile Crescent", so named because it forms the shape of a crescent starting in the southwest near the Sinai Peninsula, traveling northeast around the Arabian desert and bending back to the southeast following Tigris and Euphrates Rivers (see map on chart below). 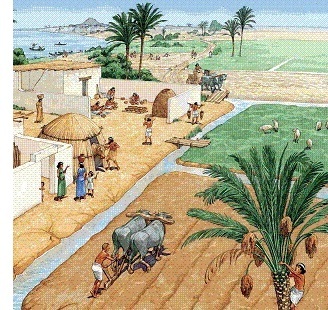 Fertile soil is natural farmland making it an ideal location for a civilization to "take root".